Jerri here with your Thursday inspiration! Today I am sharing a card I made using the Seashorse stamp from Technique Junkies. I put a stencil on top of a piece of water color paper. Using a spatula, I spread a thin layer of texture paste on top. Carefully remove the stencil. Clean your spatula and stencil immediately. Allow the paste to dry on your card before moving on to the next step. For this card I cut out my own stencil using Life Is A Beach Cricut Cartridge. If you would like to try using Texture Paste, check out the stencils for sale at Technique Junkies in the Products and Accessories section. 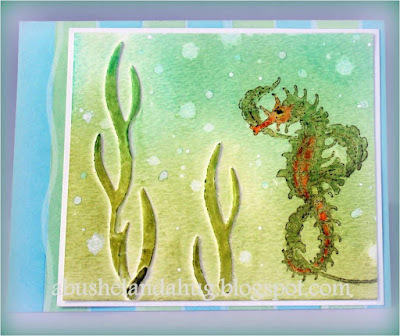 I stamped the Seahorse image using green distress ink and then embossed over the top with clear powder. Why did I do this? I wasn't sure if I would be spraying the card with water later and therefore wanted to use a solvent ink but I only had Stazon in black. I didn't want the seahorse to have a stark black line so I used the same green I would be rubbing on the card later and embossed it. I colored in the seahorse image using a watercolor technique. I used my paintbrush, my distress inks and some water to get this look. I used green and blue distress inks and rubbed them on the card using a blending tool. If you don't have a tool, you can use a sponge or Makeup wedge. I let water drip off of my fingers onto the page to create the "bubbles". When doing this I tried to avoid the seaweed and the seahorse. 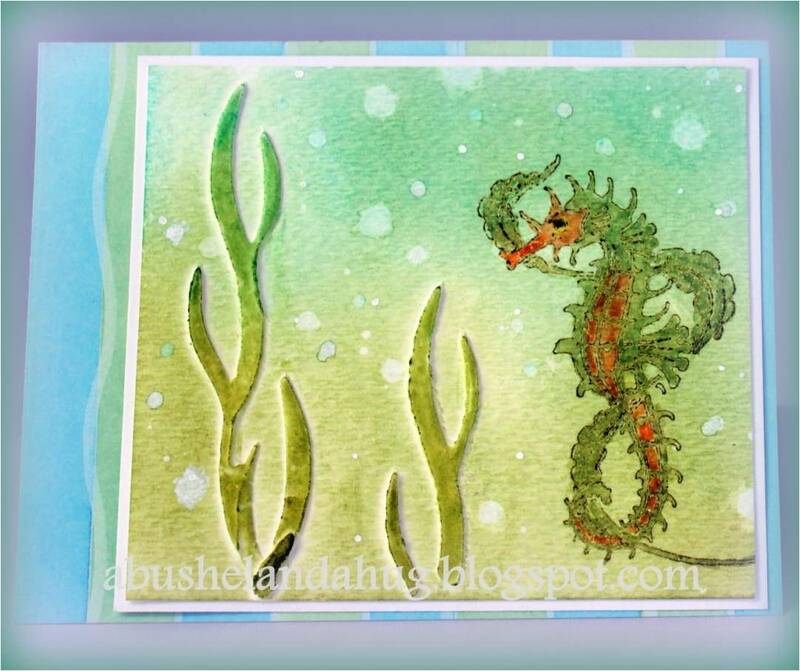 I used a Wink of Stella Pen to put sparkles on the seaweed and the seahorse. You can't see the sparkle in this picture but in person it adds just the right amount for some shimmer without being overdone. Don't forget to check out the Technique Junkies Website to see all of the wonderful stamps and products available for your own inspiration and projects.